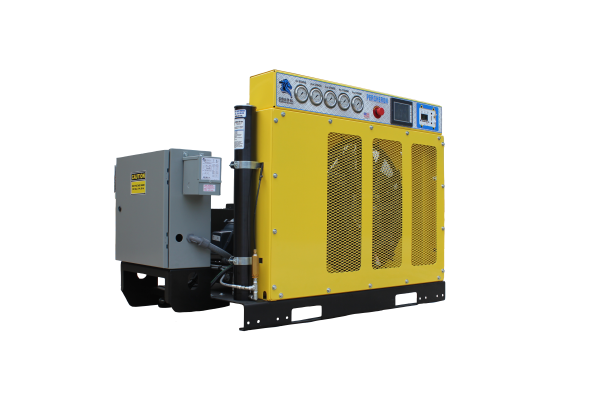 The Pegasus vertically enclosed compressor is a full-featured system that incorporates the latest technology and features to insure ease of operation and system longevity. The Pegasus compressor is designed to provide smooth, quiet operation in areas where floor space is limited, or where elevated controls are desired. 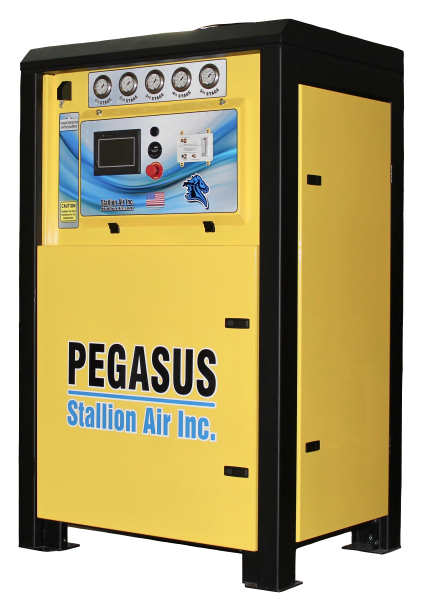 When you purchase a Pegasus, you can be assured that you are purchasing a system that is built to perform, and built to last. Stallion offers the Percheron for applications in which space is at a premium and access doors would be unusable. While this unit performs perfectly in a stationary application, its open design, low center of gravity and modular components provide the installation flexibility and ease of maintenance that is necessary for vehicular installations. These horizontally configured compressors incorporate all the Stallion features and technology our customers have come to expect. 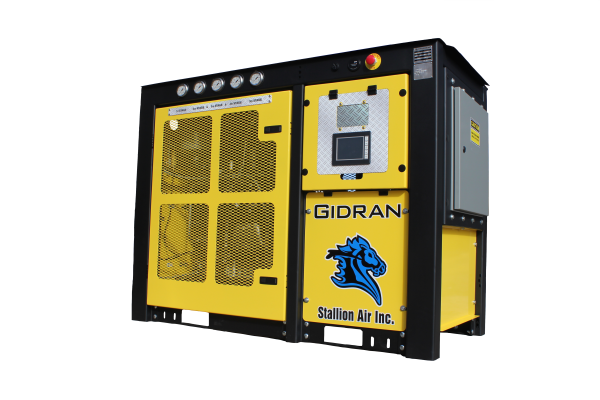 The Gidran is a ruggedly built, horizontally configured, breathing air compressor preferred by high volume industrial users. It is designed for use in tough environments where dependability, ease of maintenance and comprehensive protection are essential. The Gidran provides all this plus an appealing appearance. It is fully featured, offering the same control sophistication and ease of operation as the Pegasus. Like the Pegasus, it is protected by a fully enclosed cabinet. The cabinet provides comprehensive protection as well as an eye-catching appearance that makes the Gidran equally at home in a fire department. If you want a rugged, enclosed system but can’t accommodate the height of the Pegasus, the Gidran may be the solution for you. 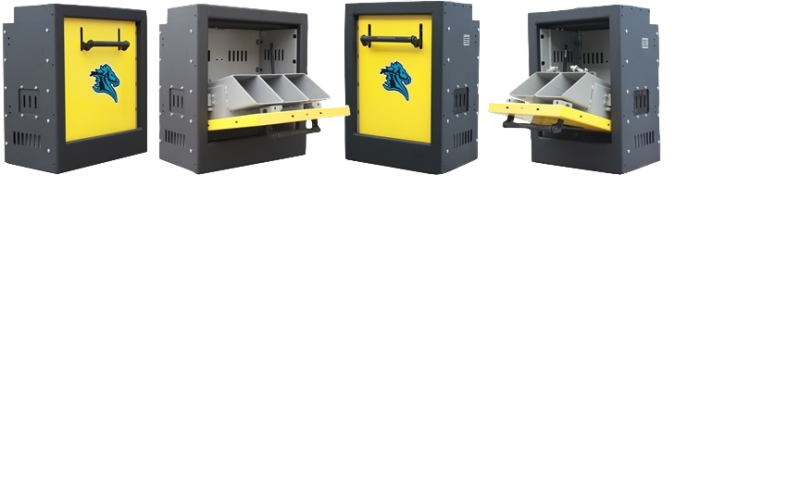 Stallion Stationary Containment Fill Enclosures provide an aesthetically pleasing solution to adding a certified cylinder refill station to your facility. Whether you are upgrading your existing system or purchasing as a component along with a Stallion compressor, these packages will help you organize your air system. mounted safety valve ensures that fill whips cannot be charged with the door open. 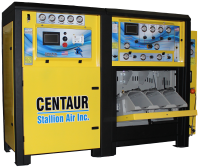 Stallion Centaur models integrate all components of a cylinder refill system into a single, turn-key package, including a compressor, air storage vessel(s), purification system, air management panel and a containment fill station. The SAT houses a generator, compressor and fill station with multiple air storage vessels in a compact, but efficient design allowing the SAT to be set up anywhere that it can be towed. The SAT can be set up at the scene of an incident and generate its own power from an appropriately sized, stand-alone diesel 3 phase generator to process air and to recharge breathing air bottles. The SAT can be powered by an optional shoreline with transfer switch while at the station. 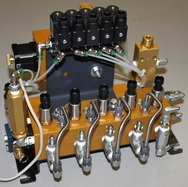 The Stallion Auto-Fill System utilizes a proprietary precision valve system, pressure transducers, a logic controller and a color touch screen to perform all functions of a typical “cascade” air control panel. The defining attribute of the system is the ability to provide constant, precise fill rate control. The screen graphics allow the operator to see all functions as they are happening in real time. An operator simply presses the “Start” key, selects the number of bottles being filled and selects the fill pressure.